A philosophical writer; lived in Rome in the first half of the eighteenth century. His life-work was a book on the universe, with the somewhat ambitious title "Pancosmosophia." It was first mentioned in the Venice "Giornale de' Letterati" (1710), and soon after in the Leipsic "Neuer Bücher-Saal der Gelehrten Welt." According to these sources, the author made a systematic attempt to refute the astronomical views of Ptolemy, Copernicus, and Tycho Brahe, and to set up a cosmogony, the underlying principle of which was that the earth was flat. He attempted to support his views by an appeal to Jewish tradition. The author had already prepared some hundred copperplates to illustrate his theories, when the Roman Inquisition prohibited the printing of the work. Ambron sent his manuscripts to Venice, but here also his efforts were frustrated by the papal nuncio, Mottei. On learning that German scholars were interested in his work, he sent it with the plates to the publisher of the "Neuer Bücher-Saalder Gelehrten-Welt," who promised to print it. The work, however, has not been published, and all trace is lost of the manuscript. 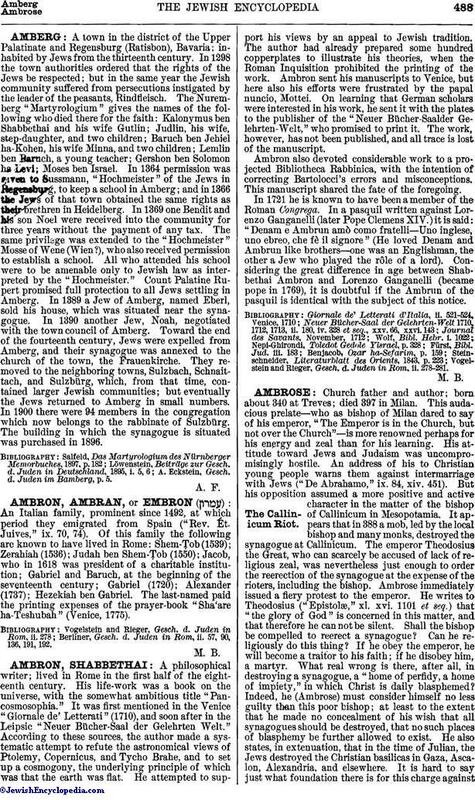 Ambron also devoted considerable work to a projected Bibliotheca Rabbinica, with the intention of correcting Bartolocci's errors and misconceptions. This manuscript shared the fate of the foregoing. In 1721 he is known to have been a member of the Roman Congrega. In a pasquil written against Lorenzo Ganganelli (later Pope Clemens XIV.) it is said: "Denam e Ambrun amò como fratelli—Uno inglese, uno ebreo, che fè il signore" (He loved Denam and Ambrun like brothers—one was an Englishman, the other a Jew who played the rôle of a lord). Considering the great difference in age between Shabbethai Ambron and Lorenzo Ganganelli (became pope in 1769), it is doubtful if the Ambrun of the pasquil is identical with the subject of this notice. Vogelstein and Rieger, Gesch. d. Juden in Rom, ii. 278-281.